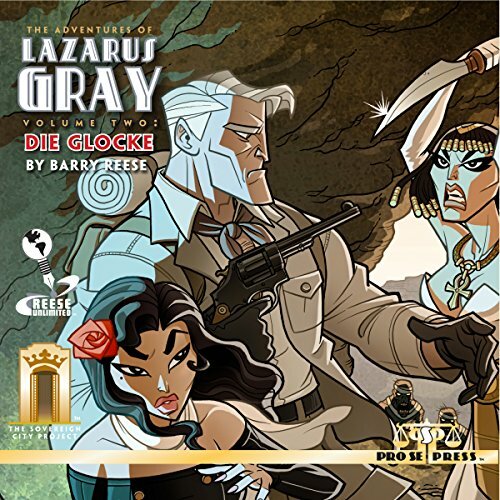 From Reese Unlimited, an imprint of Pro Se Productions, and Pro Se's Sovereign City Project comes Barry Reese’s THE ADVENTURES OF LAZARUS GRAY VOLUME TWO: DIE GLOCKE! Now a top quality audiobook produced by Radio Archives! Lazarus Gray and his aides in Assistance Unlimited return for what may prove to be their greatest challenge... What is the secret of Die Glocke? Will Lazarus Gray and his teammates discover the answer in time to stop a power hungry madman and his undead soldiers? The Adventures of Lazarus Gray returns with an epic adventure where the fate of the world is at stake. Is even Lazarus Gray up to a task that could take him to the very gates of Hell itself? Also, Assistance Unlimited takes a case that will bring them face to face with Terror and the making of a Hero! THE ADVENTURES OF LAZARUS GRAY VOLUME TWO: DIE GLOCKE is a must have for any fan of Action, Adventure, and New Pulp! This thrilling Pulp audio book is also available on Audible and Itunes. THE ADVENTURES OF LAZARUS GRAY VOLUME TWO: DIE GLOCKE is available at Amazon and www.prose-press.com.